Home :: Inspirational Jewelry :: N0179 - Red Queen's Cross - 36"
N0179 - Red Queen's Cross - 36"
2 1/4" Garnet and Sterling Silver Cross (19.9 grams), on a necklace of 3mm faceted fancy cut Garnets, 2mm round garnets and 3mm faceted seamless Sterling Silver beads. Hand strung on Silk thread and finished off with a Sterling Silver heart shaped Lobster Claw clasp (Approx. 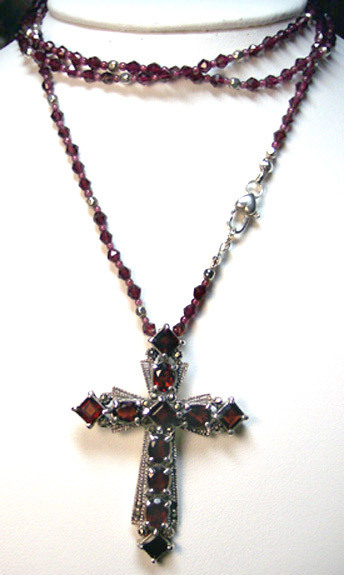 24 Grams of Sterling Silver & 100 carats of Garnets in necklace). Cross is removable from necklace.